Many things in life come in threes: one, two, three strikes—you’re out; Goldilocks and the Three Bears; beginning, middle, and end. 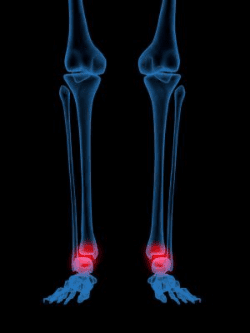 There are three bones in your ankle joint, too: the talus, which sits on your heel bone; the tibia, or shin bone; and the fibula, the thinner long bone of your leg. When you talk about ankle fractures, any of these bones could be involved, but it happens most often to the lower leg bones. Your ankle is crucial to all your movement. It is the connection between your feet—which have contact with the surface you are moving on—and your legs—which carry your body during movement. Ever heard of being between a rock and a hard place? That defines your ankle, which absorbs the hard impact of each of your steps on the floor, ground, or pavement, and bears the weight of your whole body from above. That is a lot of stress. Weak Bones – If you have a condition like osteoporosis, even a slight pressure can cause one of your leg bones to snap. Accidents – Whether you are in a car crash, you drop something heavy on your foot at work, or you bang your foot or leg in your own home, any accident can result in a fracture. Missteps and Falls – Stepping off a curb wrong, twisting on the ski slopes or ice rink, tripping on a loose rug, falling down the stairs, even landing wrong from a jump can end up breaking one of the bones. Overuse – With repetitive motions like running, the trauma builds gradually, and eventually a stress fracture can form in the surface of your bones. How do you know if you have a broken ankle? If you can actually see the bone piercing the skin, it is obviously broken, and you need to get medical help right away or you run the risk of infection or collateral damage to nerves and blood vessels. Other reasons to get urgent care are inability to move your ankle or toes, numbness around the ankle, and cold or blue feet. These could indicate serious problems that should be dealt with immediately. Immediate pain is an indicator, and it will usually be worse when you are active and subside when you are resting it. With a serious break, you may not be able to stand or walk on that leg. Another clue is if your ankle looks out of position or a different shape than the other one. Also, the area will swell, and may turn black and blue in a day or so. It is best to come in for an X-ray whenever you have an ankle injury that hurts more than a day or two. Some breaks can be handled just with rest, ice, compression and elevation—or RICE therapy. We may prescribe pain relievers or anti-inflammatory medications as well, and immobilize the ankle in a cast, splint or removable brace while it heals. Reduction—moving the bones back into correct position—may be required for more serious fractures. We may need to do this surgically if the bones are severely damaged so that pins or plates are needed to hold them in position. Dr. Matthew Paden, Dr. Brett D. Sachs, and Dr. Dustin Kruse don’t want you to suffer from complications like arthritis or compartment syndrome later because of ankle fractures that don’t heal properly. Give Rocky Mountain Foot & Ankle Center in Wheat Ridge, Evergreen, Granby, or Golden, CO, a call when you sustain an injury to your ankle. We will guide you through the three steps of diagnosis, treatment and recovery so your ankle is ready for action again. Call (303) 423-2520 to reach either of our locations near Boulder, or you can schedule an appointment on our webpage.